I’m loving the fall weather, aren’t you? We’ve actually had some cool, crisp days. Ah! On one of those wonderful days, my family and I headed to the San Jacinto Monument, 3523 Independence Pkwy, in La Porte, TX. 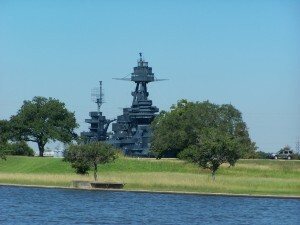 Dogs are allowed on the property but not in the museum or the battleship nearby. We wanted to be outside, so we walked around and explored. 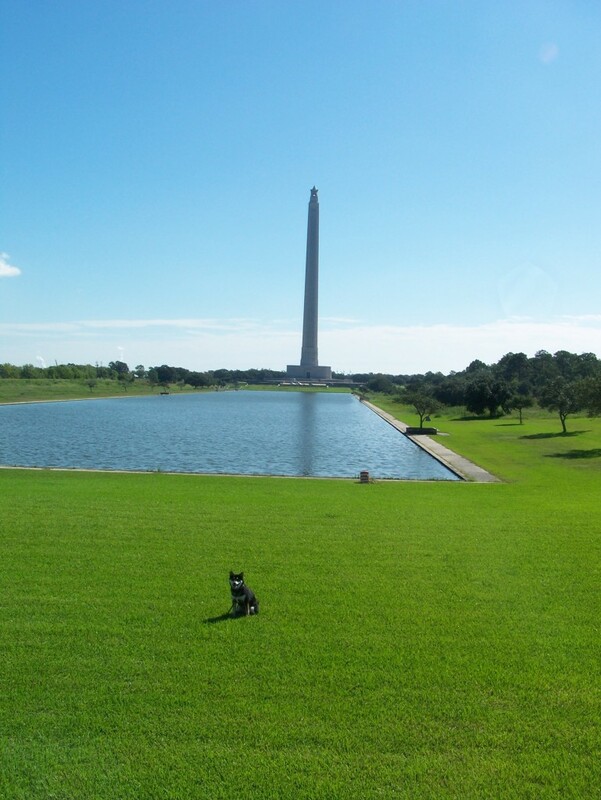 The San Jacinto Monument is tall! My humans tell me it is 567.31 feet up. That is way past my counting ability. All I know is it was impressive. Apparently, a very important battle was fought here. I’m a lover not a fighter, but I do appreciate those who sacrificed for the betterment of others. Go Texas! 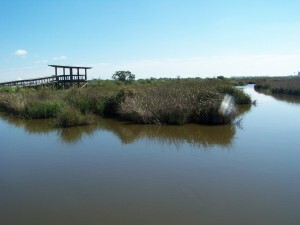 We walked through some marshy areas and boardwalks and, thankfully, didn’t see any snakes. We saw a ton of birds. Some fall color was peeking through, but the view was really of the monument, a reminder of our history. My humans went into the first floor to read about the battle. I had to wait in the car. I’m not really happy doing that, but such is a dog’s life in a human world! Anyway, one section is free, but if your humans want to tour the entire monument, they will need to pay a fee. My humans weren’t gone long, and then we headed over toward the huge ship called the USS Texas. The area was full of grassy parks and picnic tables. People were enjoying the view of the water. A small structure was selling human food. Oh the aromas! We already had lunch, but hey, I’m a dog. I can eat anytime! Alas, we did not buy any food. I won’t hold that against my humans . . . this time anyway. All in all, a nice day. Not high on the adventure scale but something different locally. If you haven’t been, you should. Understanding the price that was paid for freedom is something we all need to remember. Kumaito (Kuma for short) is a multi-tan Shiba Inu, an ancient breed from Japan, who moved from the Rocky Mountains of Colorado to Friendswood, Texas. He enjoys running almost every day with his mom, chasing squirrels out of his yard, playing with toys, pestering his brother Edmond, eating, napping … well, Kuma loves about everything and everyone! His mom, Lorraine Bossé-Smith, was kind enough to help him tell his story. She is the author of seven published books, writes for magazines on assignment, has been seen on national television, and inspires people to live healthy, balanced lives through personal training, life coaching, and workshops. You can reach Kuma through Lorraine’s website: www.thetotalyou.biz. Be sure to visit Kuma Dog’s Facebook page at https://www.facebook.com/Kumathedog You never know what he’ll be up to next!